Maruti Suzuki, the largest carmaker of the country, has registered its highest-ever domestic sales in the financial year ending 2017-18. The automaker announced record volumes of 17,79,574 units, up 13.4% year-on-year from 1,568,603 in the previous fiscal. Out of the total figure, domestic passenger vehicles sales were at 16,43,467 units, a growth of 13.8% as compared to 14,43,641 sold last fiscal. 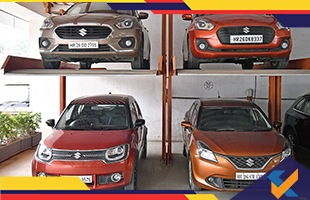 High demand was seen for models like Vitara Brezza, Dzire and Baleno, amongst others, that account for this growth. In the near future, the all-new Swift, which has manifested an immensely promising start, with over 1,00,000 bookings so far, is expected to further give a boost to Maruti’s volumes. The entry-level Alto and Wagon R together sold 4,27,183 units, up 3.2%. In March, they sold 37,511 units, up 21.1%. The Alto, which has been the best-selling car in India for 14 consecutive years, recently achieved a milestone of its own, having surpassed sales of 3.5million. Over the last few months, sales of the quintet of compact cars, namely, Swift, Baleno, Ignis, Celerio, and Dzire, has accelerated, particularly after the arrival of the new third-generation Swift which was launched at the 2018 Auto Expo. The line of utility vehicles churned out by Maruti also accounts for a major share in its growth. These include Vitara Brezza, S-Cross, Ertiga, and Gypsy. However, sales of the Ciaz premium sedan slid 8.6% to 58,913 units during the fiscal. It is being rivaled strongly by the new Hyundai Verna and the Honda City. This fight will only get tougher once Toyota brings out its Yaris sedan in India in May 2018. It is interesting to note that on the cumulative sales front, Maruti’s total sales are only 2,20,426 units short of the two million mark, which is the figure of sales that Maruti Suzuki plans to reach by2020. In all likelihood, that target would be met before 2020 arrives.